Sinkholes, not your typical dive spot. Sinkholes are created when the underground aquifer loosens the upper ground surface. The ground becomes saturated with water and begins to breakdown until it ultimately collapses. Thus forming a sinkhole. The majority of Florida sinkholes are located in Northern Florida and are not frequented by divers compared to more popular dive spots. The water is usually only clear during certain times of the year and you're basically on your own when you dive in these desolate areas. However many of the sinkholes have been around for quite some time and offer Indian artifacts and old fossils. In Cherokee sink (left) you can see Saber Tooth Tiger bones. Yes, sinkholes are different than your normal spring. They can make lakes disappear! This can be most recently noted in Tallahassee, Fl. 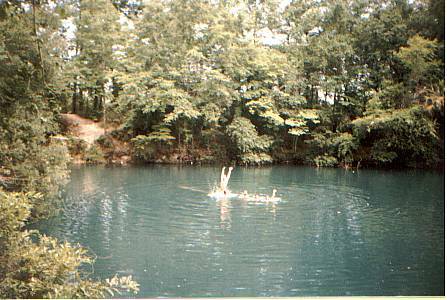 Lake Jackson, a popular fairly large lake, had almost 1/3 of its lake sucked away in September 1999 by a sinkhole, due to lower than average rainfall. Now scientists can crawl through the dry sinks and caves to investigate further and find more information as to why this occurs. Scientists say the lake can fill back up once Tallahassee gets more rain.